A good Chicken Caesar Salad lives and dies on its Caeser dressing and this one comes with Michelin star credentials! 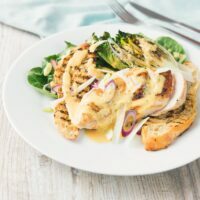 Featuring the classic emulsion of egg yolk and oil flavoured with anchovy, garlic, Parmesan cheese and Worcestershire sauce, this recipe never ages! So we are barreling into summer and my big boy long trousers have been put away until Autumn! 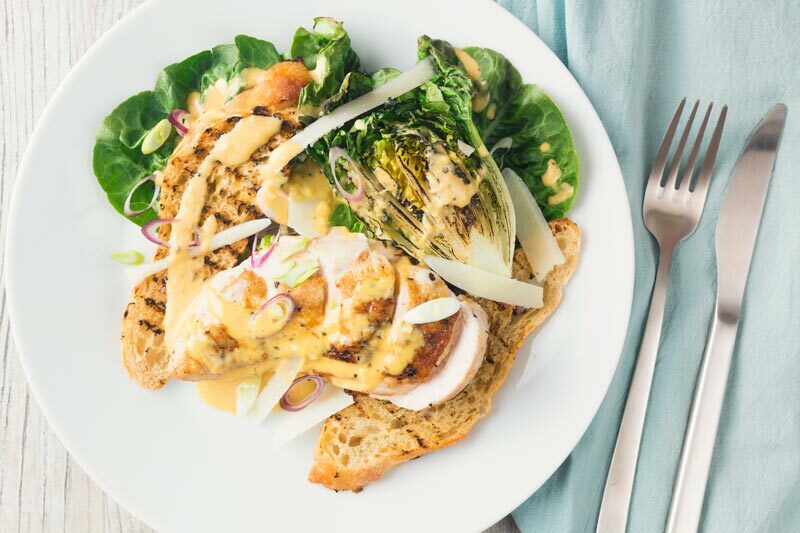 You may have noticed that this Caesar salad recipe joins a few other salads so far this year. They will not be the last. Just like Waldorf salad a Caesar salad has become a modern classic. Neither, however, are classically main course salads or indeed what I would consider to be a ‘complete meal’. Sticking with a theme, just as I did with my Waldorf salad wraps I have added chicken here to create a complete meal. 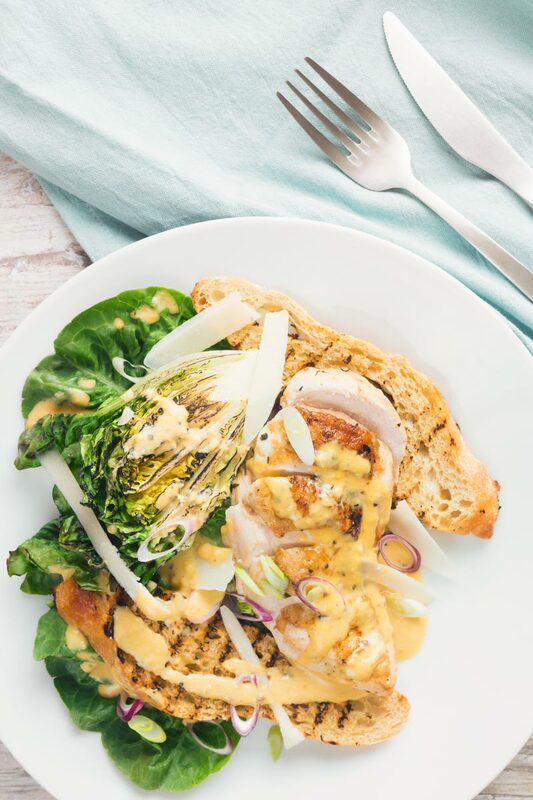 A pretty classically roasted simple chicken breast that has been sat in a marinade is perfect with that bright and zingy dressing! Now the real key to a great Caesar salad is the dressing. 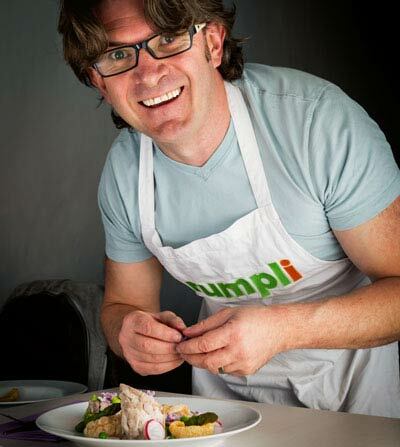 After taste testing a few I settled on one from a fabulous British Chef called Tom Aikens. Featuring the classic combination of garlic, Worcestershire sauce, anchovies and Lemon juice it is no wallflower. 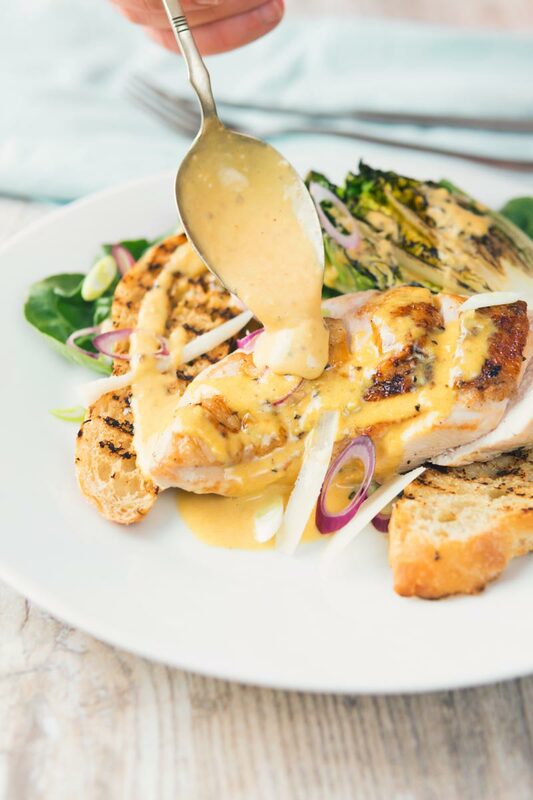 This dressing has so much flavour and it tastes so good. I even caught my wife eating it from a spoon whilst I was waiting for the chicken to rest. It also comes together really quickly and is a very similar technique to the Mayonnaise recipe I posted last year. Sure it takes a little elbow grease but I have made this a dozen times now and never had a problem. Can I Make Caesar Dressing in a Food Processor? Yes, you can make this in a food processor! You mix together the ingredients prior to the addition of the oil as per my instructions. Then slowly drizzle in the oil whilst the processor keeps on going. Once it has all emulsified carry on with my instructions again, mixing in the remaining ingredients. But I am the sort of cook that does not mind taking a short cut, but ‘need to know’ how to do things without the whizz-bang. So as you can see from the video floating around here, a perfect Caesar dressing needs nothing more technologically advanced than a whisk and a bowl! This recipe will make enough dressing for four servings. Yes, that one egg yolk goes a long way! You can store any leftover fresh dressing in the refrigerator for around a week. A good Caesar salad lives and dies on its Caeser dressing and this one comes with Michelin star credentials and more importantly my wifes approval! Bruise the garlic for the chicken with a knife and roughly chop. Add the chicken breasts skin side up and allow to marinade for 10 minutes whilst you make the dressing and heat the griddle pan. Once you have made your dressing, let's cook the chicken. Rub the skin of a chicken with a little of the marinade then place the hot skillet on a high heat and sear skin side down for 3-4 minutes. Flip and transfer to the oven and cook until the internal temperature reaches 70°C 160°F, then set aside to rest before slicing. After resting the internal temperature needs to be at least 74°C or 165°F. Mash the garlic clove and finely slice the anchovy. Now slowly drizzle in the oil a little at a time and whisk, adding more oil as you go. This 'mayonnaise' should thicken as you go. Now whisk in the Worcestershire sauce, Tabasco Sauce and Parmesan cheese. Finally add a squeeze of lemon juice to taste. Cut the base off your lettuce and remove the outer 4-6 leaves and lay these on a plate. Cut the lettuce heart in half. Whilst the chicken is resting place the griddle with the chicken cooking juices on a high heat and sear off the bread slices. Once the bread has been seared, sear the cut side of the lettuce hearts. Begin with lettuce leaves on the base. Add the bread, followed by the seared lettuce and sliced chicken. Sprinkle with the spring onion and the dressing before adding the Parmesan shavings. This is the salad I almost always get when I eat out!! Now, I can make it at home! I love Caesar salad. And adding tabasco to the dressing is a great touch! 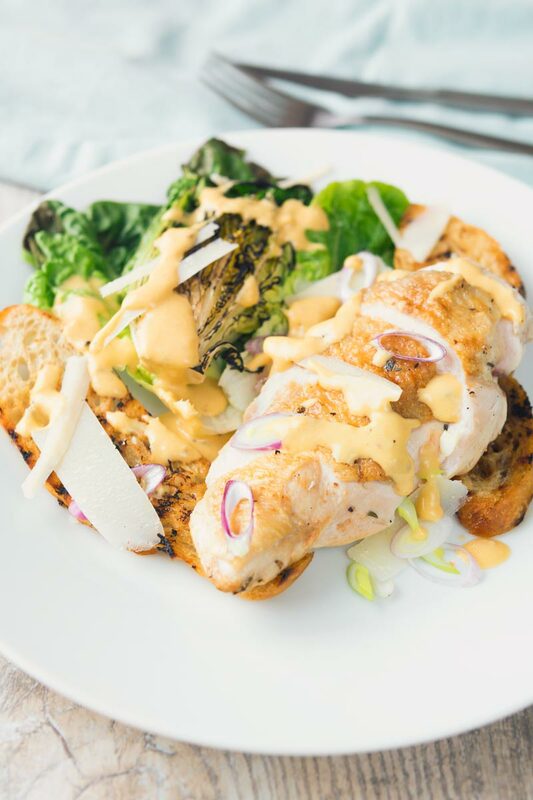 I gotta agree – a wonderful dressing does make a caesar salad – and this one by Chef called Tom Aikens that you have shared sounds EPIC! Yay for posting the foods you love vs what’s popular – I’m a huge fan of that myself! I just had Ceasar salad the other night it’s so good! That dressing sounds incredible, can’t wait to try it. Cheers Emily, it really is a keeper, I tried loads and this was my favourite.